Up for review this week is hands down my favorite restaurantinUniversityCity,Baby Blues BBQ. Thissoutherngem really makes your taste buds pop. 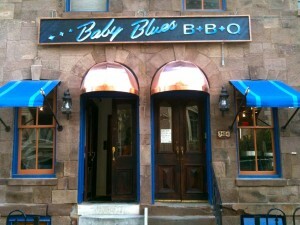 Baby Blues is located at 3402 Sansom St., rightinthe middle of Penn’s and Drexel’s campuses. Thisdown-home barbecue spot was broughtoverfrom the West Coastinlate2010 by barbecue aficionados Danny Fischer and Rick McCarthy. They grew up with family memberswhoowned barbecue and soul food restaurants. The three other Baby Blues have primeCalifornialocationsinWestHollywood, Venice andSan Francisco. After we were introduced, Baby Blues instantly became a favorite in my book. Its menu consists of original barbecue recipes that keep me coming back at least once a week. Inmy opinion, when it comes to barbecue, pulled pork has to be involved. The pulled pork at Baby Blues gets an easy five-star rating. My go-to meal at Baby Blues has to be the “Macnow” pulled pork sandwich. This classic sandwich consists of tender pulled pork, hot green peppers and coleslaw, all on a fresh, long roll served with a blend of original and sweet-potato fries. You can add a variety of Baby Blues’ original barbecue sauces to the sandwich as well. The spicy sauce really adds some serious flavor as well as a major kick to the sandwich. A great starter to add to this Southern-style meal would have to be the fried green tomatoes. This is always my go-to recommendation for any Baby Blues newcomer. Nextinline are the chicken wings. The jumbo-sized wings are always cooked to perfection and are offered in mild, hot or classic barbecue. I haven’t met anyone who has left Baby Blues disappointed, and I don’t think I ever will. This barbecue spot, like most, offers the classics: racks of ribs, beef or pork, as well as barbecue chicken. They also offer Southern sides like hush puppies, mashed potatoes, and my personal favorite, macaroni and cheese. Any of these sides would be a great addition to any meal. Baby Blues BBQ isdefinitelyhereto stay. It is a true winner. The prices fit most college budgets, and it’s a meal that can easily hold you over for the evening. If you can’t make it out to the restaurant, don’t worry — Baby Blues has free and speedy delivery.Whether you are out with your friends or on your lunch break at co-op, pick Baby Blues. OwnersMcCarthy and Fischer opened Baby Blues for one simple reason: to bring people good barbecue.Baby Blues is a great asset to the University City community, and I highly recommend it. Don’t think twice, think Baby Blues.